Show the slope value in digital display in real time. 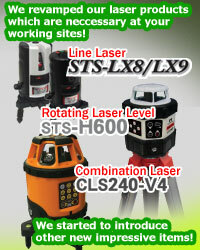 For management of Horizon, Vertical and Slope. As it is equivalent to IP54, it can be used with wet hands. And also it can be used in the dusty environment. LCD backlight helps you to read in the dark place. Due to V-cut, it is stable on the pipe！ It is very easy to manage gradient of pipes. The built-in magnet is effective for steel frame, pipe and plant construction. When it is difficult to read the display even you can touch the instrument, pushing the button makes the indication fix and you can read it later. When you have some trobles in accuracy, it is possible to re-adjust and confirm the accuracy at the operation site immediately. Setting your desiarable angle as ０°, it is possible to show the comparison with other angle. Horizontal and vertical directions will be shown by triangles located both sides of LCD. If you reverse the instrument up-side down, numbers on LCD also reverse. It avoides having mis-reading. When at 0°, 90°, 180°and 270°, it will inform you by buzzer sound.